The data shows a global mean sea level rise of only 1.85 mm/year since January 2005, a deceleration of 44% from the prior rate of 3.3 mm/year. At this rate, sea levels will rise 7 inches over the next 100 years. [Note also the bump in 2009-2010 is due to the temporary El Nino conditions] Break out the life rafts! Abstract. 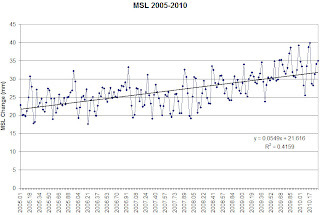 A new error budget assessment of the global Mean Sea Level (MSL) determined by TOPEX/Poseidon and Jason-1 altimeter satellites between January 1993 and June 2008 is presented. We discuss all potential errors affecting the calculation of the global MSL rate. We also compare altimetry-based sea level with tide gauge measurements over the altimetric period. 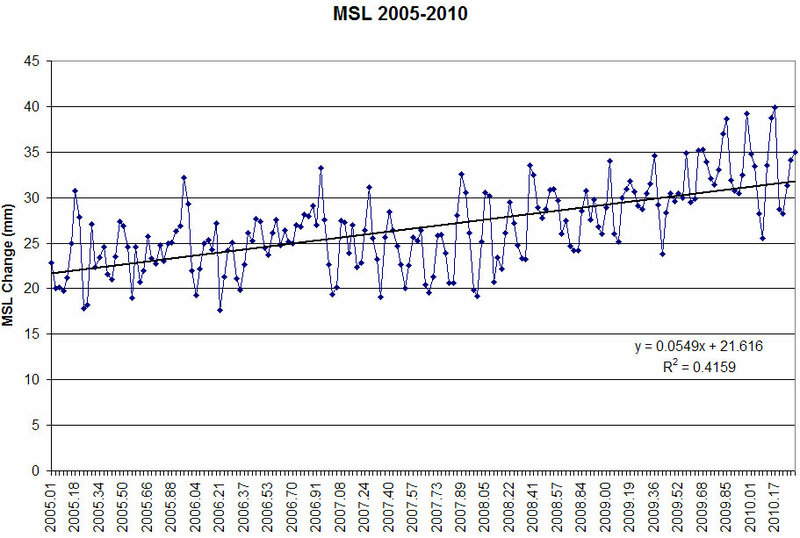 This allows us to provide a realistic error budget of the MSL rise measured by satellite altimetry. These new calculations highlight a reduction in the rate of sea level rise since 2005, by ~2 mm/yr. This represents a 60% reduction compared to the 3.3 mm/yr sea level rise (glacial isostatic adjustment correction applied) measured between 1993 and 2005. Since November 2005, MSL is accurately measured by a single satellite, Jason-1. However the error analysis performed here indicates that the recent reduction in MSL rate is real. Sea Level Expert: "80% of us disagree with the IPCC"
Drat! I was going to write a humorous story about the advantages of global warming and buying future waterfront land. Well, maybe I will anyway. The Eastern Seaboard Region continues to adjust to the melting of the continental glacier in the period 10,000 to 20,000 years ago. The vertical movement of the Earth affects relative (apparent)sea level. Consequently, the paper cited is about vertical movement of the Earth, not about the effect of warming upon sea level. Whenever we read about rising sea level we ought to ask: Is sea level rising or is the land falling? Some distance from the continental glacier there is what is known as the forebulge. This forebulge continues to fall which makes it appear that sea level is rising at a higher rate than would result just from warming of the the ocean or melting of existing glaciers. This paper concerns Mean Sea Level, not relative, measured by satellite altimetry with glacial isostatic adjustment.